Sorry for the late response, just came home Did you manage to fix the problem? Deadline will be extended for sure but will ask for the exact date and keep you informed. 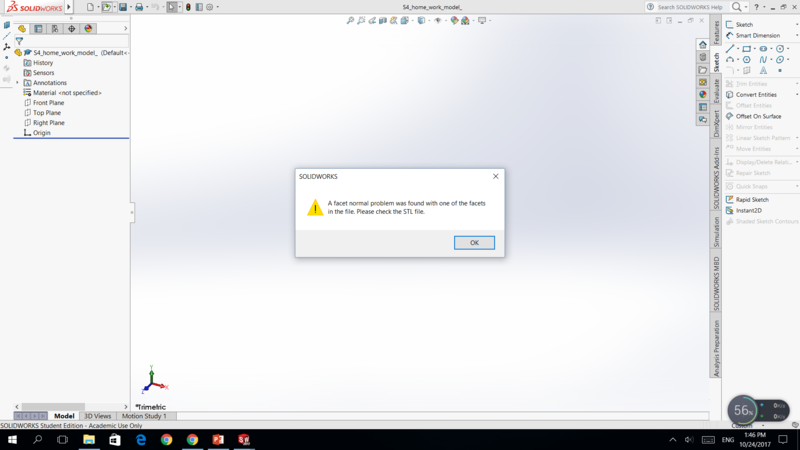 Sorry for asking again: Are you using SolidWorks? Also big sorry from my side. Hope you still managed to get your work done! Did you make sure to set every parameter according to the step-by-step tutorial? Also make sure you mesh your own front wing properly which might cause some issues in the simulation process! Any news for the meshing part @brendan_a_b? P.S. : Can you share your project with me please? Any news @nishank_a? Let me know how things go. Trying to help wherever I can. I had the wing assembly in the same orientation as the car. i can see the car mesh in the assembly as well. I kept getting the facet normal problem. Still only my wing is showing but not the car. Thanks for the tips though, making it easier to visualize the model as a whole. @jousefm it still stuck at 100% finishing up . Its 2am in India so i am going to call it a day, will check later in the morning. Can you post a screenshot of the error? It is shown in your CAD program right? Will see if there are some methods to fix this. Thanks a lot Share the project with me. Will keep an eye on it! Had a look at it @Flavius! Due to major problem getting the model together - the wing doesn’t seem to like the car body, I picked up Kowalski’s model but ran into a meshing problem, see automated info sent to response team today. Still working on getting this resolved. Apparently I’m not the only one having issues. As always we appreciate your and the team’s help. I’m suspecting that this message has to do with the car not showing up after the merge. I can still see the car model in SolidWorks after I click ok on the popup. Same message when opening up the stl file with or without the wing in the assembly. Trying to figure out a solution together (deadline has been extended anyway so no pressure ). Can you share the most recent project with me please? Want to have a look what the log says. Yeah, I had this too. but is it strange. -if is only the wing no error. -Illegal triangles were found after surface tesselation. There could be a problem with the CAD geometry. Trying to proceed anyway. -The tesselated surface is not closed. There could be a problem with the CAD geometry (such as self-intersections). Please inspect your geometry. Trying to proceed anyway. My mesh has 42 illegal faces over 8.5M elements; however, I am unable to continue with the simulation because when choosing the mesh for the domain, the mesh appears but I cannot select it. I have thoroughly inspected the geometry and I do not find any possible deffects or surface problems and the geometry is pretty similar to the original, but changing a little bit the endplates and the angles of attack of the airfoils. Do you have any sugestion to get through this issue? Hi @jousefm is there any info about when the extended deadline will be? i could do with a bit more time after struggling earlier with accessing simscale. I’ve come further than i did last year, i managed to get the wing to merge with the model! Will let you know tomorrow.